As we grow older, we tend to let things slide, but senior dental health shouldn’t be one of them since it affects your entire body. Instead, seniors need someone to either remind or help them prioritize their oral health. Otherwise we commonly encounter issues like dry mouth and periodontal disease. There are several reasons why we should take these issues just as seriously as we take caring for seniors’ hearts. Research shows there’s a connection between gum and heart diseases. Taking care of your oral hygiene will help ward off heart attacks, strokes, and other heart conditions. The American Academy of Periodontology states that people with periodontal disease, gingivitis, cavities, or missing teeth are twice as likely to have these issues. Older adults who have poor senior dental health are more likely to develop pneumonia because they’re breathing bacterial droplets from their mouth into their lungs. This is something that nursing homes especially must be on the lookout for. Periodontitis (severe gum disease) impedes upon your body’s ability to properly use insulin. High blood sugar causes gum infections. The good news is you can prevent both things by maintaining routine dental checkups. Staining and thinning of enamel cause dentin (the bone-like tissue under your tooth enamel) to show through. This is because of what we eat and drink. Ultimately it causes our teeth to look darker. When we leave plaque and food behind in our teeth it causes gum disease. This senior dental health issues is also caused by the use of tobacco products, eating an unhealthy diet, and having poor fitting dentures or bridges. Diseases like anemia, cancer, and diabetes can also cause gum disease. Ultimately, regardless of its initial cause, gum disease leads to tooth loss and other problems throughout your entire body. Taking medications or receiving radioactive cancer treatment (especially in your head or neck) can cause you to have a dry mouth. When this happens, you won’t produce enough saliva, which is necessary for protecting your teeth from decay. Saliva also prevents infection by controlling the bacteria, viruses, and fungi in your mouth. This is why it’s considered a serious senior dental health issue. It’s very common for seniors to experience root decay because their tooth’s root is exposed to foods’ acid. When this happens, their gum tissue recedes causing root exposure. Since roots don’t have enamel to protect them, they’re prone to decay. One senior dental health problem most people don’t even think of is an uneven jawbone. This happens because seniors lose teeth and don’t have them replaced with false teeth. It causes the rest of their teeth to drift and shift into open areas, which often results in issues with their bite and overall appearance. Poor fitting dentures can lead to the inflammation of your tissue beneath your denture. This can also be caused by bad dental hygiene or buildup of Candida albicans (a fungus). Regardless of how this senior dental health is caused, it’s very uncomfortable. Helping seniors take care of their dental hygiene should be a priority. Everything from medical conditions (e.g. arthritis makes it hard to brush or floss) to certain medications can impede upon them here. This is why you should take them to the dentist on a regular basis. You should also have their hearing tested routinely as well. 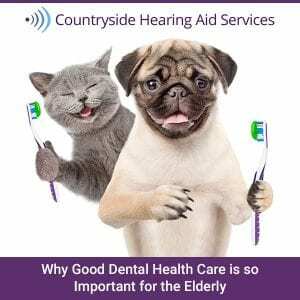 Countryside Hearing Aid Services is available to help you with this. They understand the importance of your loved one’s overall health and look forward to helping you take care of them properly.